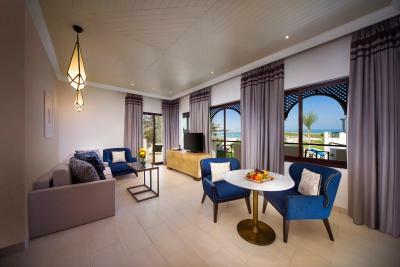 Lock in a great price for Hilton Ras Al Khaimah Resort & Spa – rated 8.2 by recent guests! Facilities were good, lots of pools places to relax, beach and water sports were good. I loved the courteous staff and awesome beach facilities. Never a dull moment. I loved the feeling of being free and laid-back in the whole place. Overall vibe was awesome. I did not have breakfast this time, although we had the breakfast brunch before and it was good. We did not get a package that included that, so it was too expensive. The food was pricey. I forgot my Sonicare toothbrush and they were able to send it right away!! The food truck had great cheap food!! I hope they keep that. 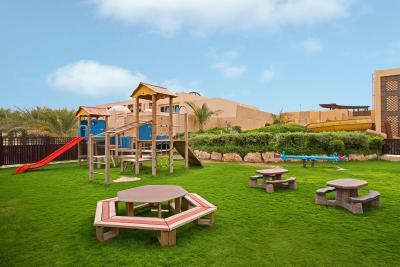 Everything about Hilton Ras Al Khaimah Resort and Spa is fantastic. There's something for everyone to do. 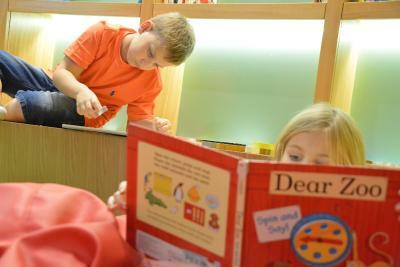 Following a full day at the pool and beach, my kids enjoyed themselves spending their evenings at The Hide, which is a hang out area for teenagers. They made friends there and played table tennis, foosball, pool, card games, etc. Hilton Ras Al Khaimah Resort & Spa This rating is a reflection of how the property compares to the industry standard when it comes to price, facilities and services available. It's based on a self-evaluation by the property. Use this rating to help choose your stay! 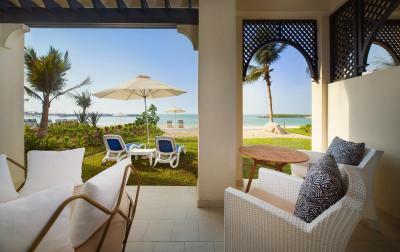 One of our top picks in Ras al Khaimah.This luxurious 5-star resort is on the northern tip of the Arabian Peninsula. It has 0.9 mi of private white sandy beach, a separate children's play area and offers villas with furnished balconies and views of the Arabian Sea. Hilton Ras Al Khaimah Resort & Spa accommodations include free WiFi a flat-screen TV, mini-bar, luxury bedding and floor-to-ceiling windows. All features city or garden views. The private bathrooms have marble countertops and bath tubs. The resort features 11 international dining options ranging from International, Lebanese, Brazilian, and Italian. A pool bar, beach bar and SOL bar are also available. 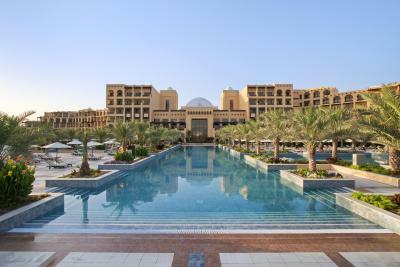 Hilton Ras Al Khaimah Resort & Spa has 7 swimming pools including salt water pools. 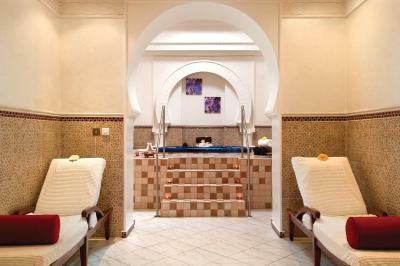 There is a 24-hour fitness center with cardio vascular equipment, and a spa center that offers a variety of treatments. The Ras Al Khaimah International Airport is located 14 mi from Hilton Ras Al Khaimah Resort & Spa. Dubai International Airport is 75 minutes away by car. 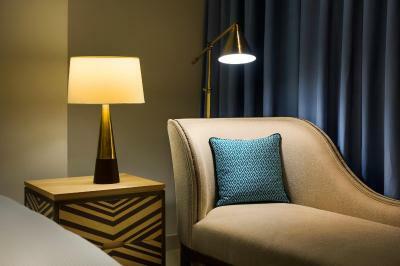 The hotel offers free private on-site parking, and an airport transfer service on request. 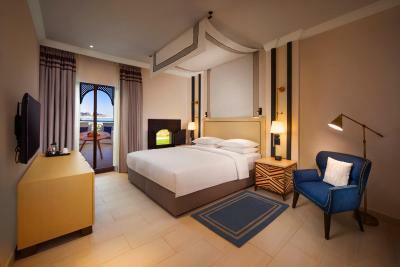 When would you like to stay at Hilton Ras Al Khaimah Resort & Spa? 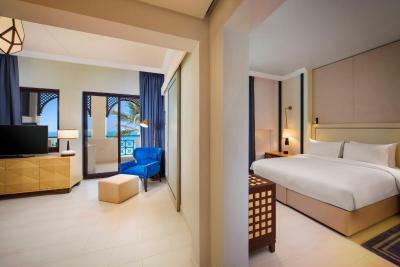 Featuring a balcony with a sea view, this room includes a king-sized bed and sofa. 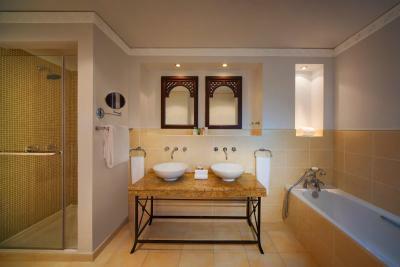 The spacious bathroom features a separate bathtub and walk-in shower. Stay connected with complimentary WiFi and catch up on work at the work desk. 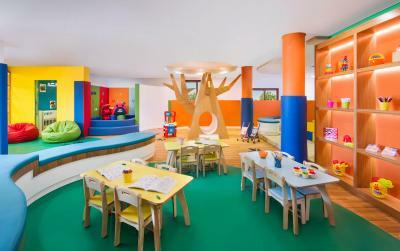 This room accommodates 2 adults and 2 children. This room features a balcony or terrace with city or garden views. It includes a seating area with flat-screen TV and a mini-bar. This air-conditioned room features a balcony or terrace with city or garden views. It offers 2 queen beds, a flat-screen TV, a mini-bar and a tea/coffee maker. 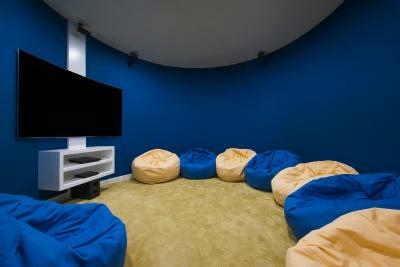 This room can accommodate up to 2 adults and 2 children or 3 adults. 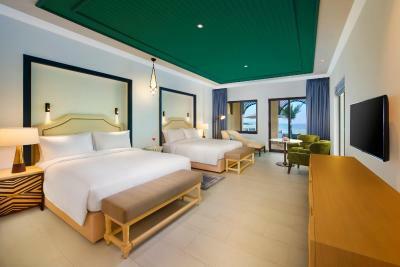 Located in the main building, this air-conditioned room provides sea views and comfortable amenities. It includes 2 queen-sized beds and sofa. 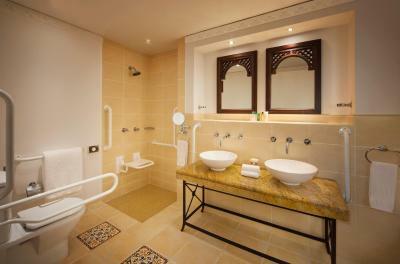 The elegant bathroom includes a separate bathtub and walk-in shower. Stay up-to-date on business at the work desk. Surf the web with complimentary WiFi and watch your favorite shows on the HDTV. This room sleeps 2 adults and 2 children. 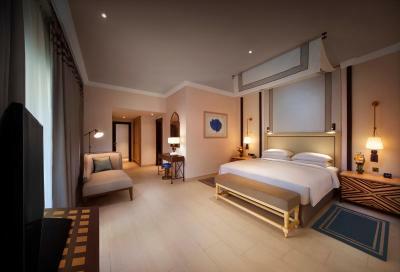 Featuring views of the Arabian Gulf, this room provides direct access to the beach and features a comfortable king-sized bed. Take in the fresh sea air from the private balcony or garden terrace (subject to availability). Freshen up with a bath or shower in the bathroom. Relax in the easy chair and watch a show on the HDTV. This room also includes complimentary WiFI. This villa can accommodate 2 adults. This spacious villa feature a balcony with pool and sea view. It includes a separate living room with a dining table. Some villas have a hot tub. This villa can accommodate up to six adults. Featuring a sea or city view, this suite is decorated in warm tones offering a separate living and dining area. It offers Wi-Fi, 2 flat-screen TVs, a DVD player. 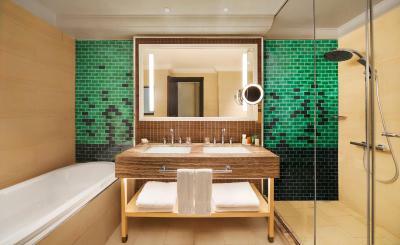 Some suites offer private balconies and a spa bath. The large bathroom comes with walk-in shower and a hot tub. Sleeps 2 adults and 2 children and accommodates a maximum of 4 adults. Located in a villa of the resort, these newly refurbished, sumptuous suites offer a private living area separated by a sliding door, for further privacy. A spacious terrace with direct access to the beach, with stunning sea views alongside, and exquisite lounge furnishing create the perfect location. This suite can comfortably accommodates 2 adults and 2 young children or 3 adults. 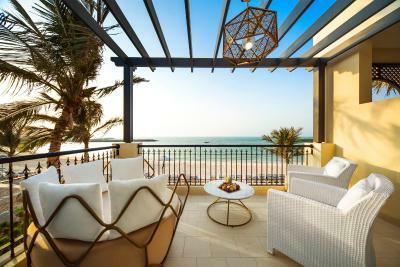 Enjoy the stunning views of the Arabian Gulf from the terrace, located in a beach villa of the resort, these newly refurbished rooms are the epitome of sophistication and furnished with 2 queen beds. This villa comfortably accommodates 2 adults and 2 children and up to 4 adults. Enjoy the stunning views of the Arabian Gulf from the terrace, located in a newly refurbished sea front villa which showcases the essence of sophistication and is furnished with 2 queen beds. This villa comfortably accommodates 2 adults and 2 children or 4 adults. 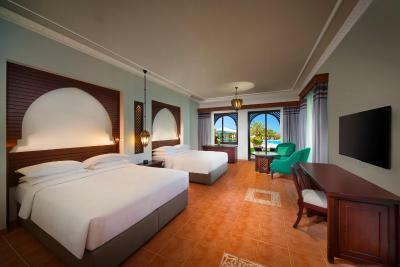 These spacious villa rooms offer 2 queen beds. Enjoy an upper floor room with a private balcony overlooking the pool. Ground floor rooms have direct access to the pool via the private terrace. 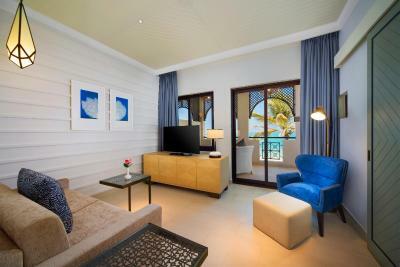 This villa room accommodates up to 2 adults and 2 children or 4 adults. This extra spacious villa offers 2 spacious bedrooms, each with a king size bed and a living room with a direct pathway to the beach or to the private pool from the terrace, are perfect for families seeking a home away from home experience. 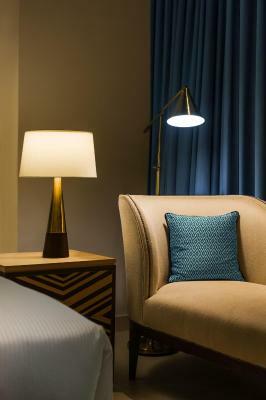 The suites with connecting rooms comfortably accommodate up to 6 adults. Discover a beach resort oasis on the northern tip of the Arabian Peninsula, Ras Al Khaimah in UAE, the most pristine of the Emirates. Only 50 minutes from Dubai International (DXB) Airport and 25 minutes from Ras Al Khaimah (RAK) International Airport, you will find a more leisurely pace of living. 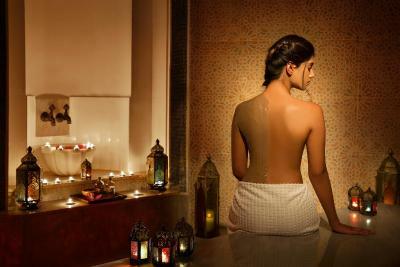 House Rules Hilton Ras Al Khaimah Resort & Spa takes special requests – add in the next step! Hilton Ras Al Khaimah Resort &amp; Spa accepts these cards and reserves the right to temporarily hold an amount prior to arrival. Hilton Ras Al Khaimah Resort & Spa accepts these cards and reserves the right to temporarily hold an amount prior to arrival. 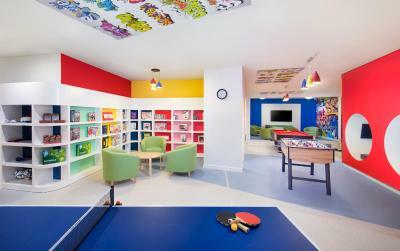 Please note that children aged 12 years and under stay for free when sharing a room with their parents. Children under 6 years eat for free while children from 6 to 12 years receive 50% discount in the all-day dining restaurants. No jacuzzi for free for guests..
Food was very mediocre. Staff not so as attentive as other hotels in the area. The spa facilities were terrible. The steam room definitely needs a revamp. I had to leave as it didn’t seem that clean altogether in the spa area...showers toilets etc. Quite a lot of ’upselling’ going on. Not the fault of the hotel but there were poisonous jellyfish swept ashore. Staff was always fast to remove them anyway. I hope they will have more beach/pool towels specially when its crowded. Not all the staff were professional, some were scared to use Apple pay! The food options, and the meals we had were terrible. At the pool, we were told that there are no towels! You have to walk a lot from one area to the other to get water, towels, etc.. no proper service at the pools. No one passes by to check on orders. I would not recommend this hotel especially that we paid 1,283 Dhs for ONE NIGHT! The pools are ok. The room is clean. Part of the hotel only has been renovated. The pool area is not very clean and we didn’t manager even to get some towels ! Service was below par for a Hilton hotel: Parking valet was missing when I arrived Check-in was sub-par (reception did not provide towel cards, did not point the way to elevators to the room, no welcome drink - I saw guests which were much better looked after the next day) dinner service at a la carte restaurant was slow Towels at the pool/beach were not available for a good 30 minutes The manager was informed on Day 2 and she tried to make it up but as I was leaving in 12 hours, there was not much she could do. Room was spacious. Bathroom had bath AND separate shower cubicle. 1. We were checked in after 3.30 pm which meant my family and I had to wait for the rooms to be ready. Not an ideal start to the holiday. 2. We had to wait over an hour for towels on both days of our stay. This is completely unacceptable. We had to involve the duty manager on this issue who eventually managed to provide us with towels. 3. Our room was not cleaned during the day (and we didn't place any sign on the door). We raised this with reception on checking out. 4. We requested adjoining rooms which could not be accommodated. 5. We found the price for f&b more expensive than anticipated. I dont recall the price being this expensive when we stayed previously. 6. Our room (3505) was supposedly a Sea View room. The sea was only partially visible and not what we had in mind. 7. The room blinds separating the bathroom from the living area didn't work and some light bulbs were fused. Available TV channels were also very limited. 1. Beach location is great. 2. We really enjoyed the new beach restaurant.